Irish band, Socks in the Frying Pan, performs at The Matthews at 7:30 p.m., Tuesday, Mar. 27, 2018. Their dynamic vocal harmonies, virtuosic musical ability, and their onstage wit has captured and captivated audiences the world around. This is the fifth event of our 2017-18 Subscription Series season. Cost is $25 adults, $10 youth & BHSU students. Socks in the Frying Pan is a multi-award winning trio from County Clare on the West coast of Ireland, the universal hub of Irish traditional music. One of the most sought after groups in Irish music today, the worldwide “Socks Invasion” continues. 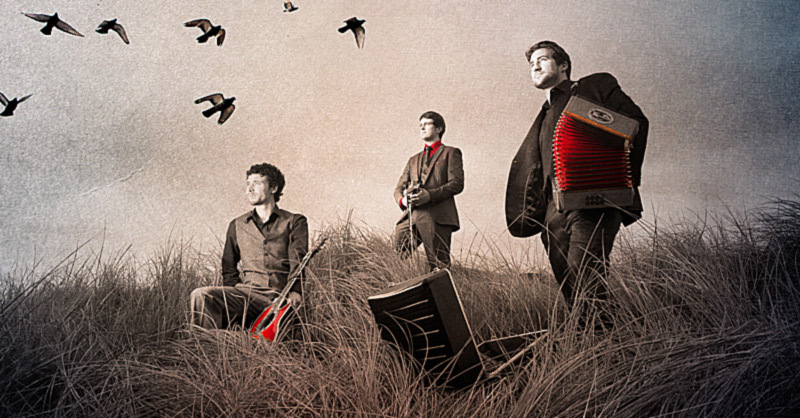 Socks in the Frying Pan is comprised of Aodán Coyne – on guitar and vocals, and the accomplished Hayes brothers; Shane Hayes on accordion and Fiachra Hayes on fiddle and banjo. This youthful trio blends Irish traditional melodies with their own personal flair which has gained them critical acclaim and accolades including “New Band of the Year” by the Irish Music Association. The group has been embraced in the United States, having been booked by every major Irish festival and praised for their modern traditional style and energetic approach to music. They have a clear love for live performance which only compliments the traditional essence in their shows and makes for a truly unique form of entertainment. Scroll down to learn more about each band member. Like the rest of the band, he was born and raised in Ennis County Clare, the traditional music center of the universe. From the moment he could walk he could be found sitting at the piano in his house pressing keys and experimenting with the different sounds. He began lessons on the tin whistle at age six and age eight had begun playing the accordion under the watchful eye of the great Kerry box player Tom Lynch. Under expert tutelage from Connor McCarthy & Martin Connolly, he has emerged on the scene as one of the most prominent up and coming figures in Irish music. Described as ‘prodigious’ by Irish Music Magazine, he has enjoyed great success since the release of his critically acclaimed debut album ‘Small Towns in Built-up Areas’ in 2010. Shane was awarded best accordion player 2015 by the Irish Music Association. His energetic style and ferocious technique have earned him the respect and admiration of his peers and critics alike. His quick wit and friendly charm add to his reputation as the front man of the group. He is much sought after for recording and performance and to complete his CV has achieved a Masters of Irish Traditional Music from the University of Limerick where he is highly regarded as a top musician. He has been influenced heavily by many forms of music most notably pop, funk, blues and world music. When not playing music he can be found playing a game of handball or drinking a cup of tea with a pink snack. Fiachra started playing the fiddle and any other instruments that he could get his hands on from the tender age of three. Along with being encouraged by his family, he was inspired by the great musicians living in Ennis, which is a town steeped in traditional Irish music. His traditional fiddle teachers who have influenced his playing include Joan Hanrahan and Aisling Mulhern. He had begun music tuition on classical violin in ‘The Clare Music Makers’ from a very young age. Here he loved playing as many instruments as he could get his hands on which including the piano, mandolin, whistle, and guitar. Having been influenced by his older brother who had been playing traditional Irish music, Fiachra chanced his arm at the button accordion for a time and did not stop there. He states that he always had a special love for the banjo, having been inspired by his neighbor and close friend, the late Steven Madden. But it is his fiddle playing that was his first musical passion and he has been recognized as an outstanding player in his field. He has participated and won many music competitions including the prestigious ‘Ceol an Gheimhridh’ and the under-eighteen fiddle competition in County Clare. He shares these titles with such renowned musicians as Martin Hayes, Paddy Canny, and Tara Breen, to name but a few. This, along with having competed on the All-Ireland stage with varying groups from County Clare, strengthened his musicianship. He has the musical capability and intuition to easily adapt to varying musical style and genres, gigging with local rock, blues, and indie bands in his spare time. He reached the final of TG4 program ‘Feis and Blood’ and has just completed a teaching degree with music from Mary Immaculate College Limerick. Having been brought up in the musically rich Coyne family where his grandfather, Eamon, and father, Mick, were both well-respected traditional musicians, he began playing guitar at age fifteen and went on to win a number of acoustic competitions around the country. This, in turn, stemmed onto his time with the ‘Inis óg’ grúpa ceoil where he began to focus more on traditional Irish music and alternate guitar tunings especially DADGAD. With this, his music education continued at Dundalk Institute of Technology, where he qualified with a B.A. in Applied Music in 2008. He has performed at prestigious venues around the world in various bands as well as in a solo capacity. Some settings include the president of Ireland residence, Áras an Uachtaráin, the president of Malta’s palace, at the North & South ministerial council, the Olympia and the Music Academy of Paris and the University of Cambridge. More recently he has toured extensively performing at such renowned events as the Milwaukee Irish Fest, Winfield bluegrass festival, the festival of Oulu in Finalnd, the Kansas City Irish Fest, and at Caltech University in California. He was a founding member and the President of the Dundalk Music society. He has been teaching guitar and vocals for a number of years and has worked with The Summer Music on the Shannon course in conjunction with ‘The Clare Music Makers Academy’ at the University of Limerick. KEVN Black Hills, South Dakota Arts Council, Great Western Bank, Killian’s Tavern, Black Hills Pioneer, Century 21, Bay Leaf Cafe, City of Spearfish, DeSmet and Biggs, LLP, Forcoli & Sons Painting, Wolff’s Plumbing & Heating, Inc., Lucky’s 13 Pub, Spearfish Holiday Inn, Zonta Club of Spearfish, Optimist Club of Spearfish, The Matthews’ family, The Kelley family — CLICK HERE to visit these sponsors’ business websites. This entry was posted	on Monday, March 12th, 2018 at 2:48 pm	and is filed under News & Blog, Past Live Shows, Subscription Series 17-18. You can follow any responses to this entry through the RSS 2.0 feed. Both comments and pings are currently closed.